If Link Can Be In Soul Calibur, Why Not Sonic? Home » News » If Link Can Be In Soul Calibur, Why Not Sonic? 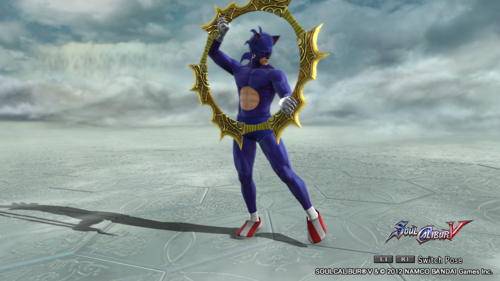 Taken from the Tumblr “F*** Yeah, Soul Calibur Creations!” (although this was created by awwyeahsuperheroart) in which a truly terrifying Sonic has been created complete with Ring Blade weapon… Naturally. Despite looking “like he works at the strangest strip-club in the world” this was created using the character creation system from Soul Calibur V (a game which is BEYOND disappointing) which has also been responsible for creating a vast number of other creations including Toad from the Mario series, Dr. Zoidberg from Futurama and the King Of All Cosmos from the Katamari series.